Mhumhi registered that the scream that had come from within the concrete building did not sound like Tareq, though he had little time to discern whether that was good or bad. But there were more immediate problems directly in front of him. 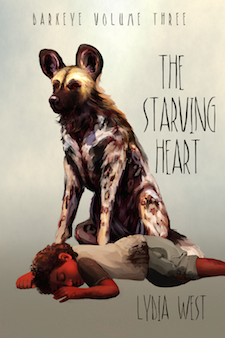 The three painted dogs were all staring, with bloodied Vimbo in the center. He recognized Hlolwa and Imbwa from their markings and their notched ears; there was no mistaking them. There were another few tense seconds of silence. Blood dripped loudly down from Vimbo’s chin onto a crumpled plastic bag. Something flickered between the three painted dogs. Abruptly they swung away from Vimbo, separating into three different directions, bounding and clambering over the garbage piles. Vimbo gave a growling grunt and then hurled himself forward, after the center dog. “Vimbo!” cried Mhumhi, lurching to his feet. He ran a few steps forward before stopping and looking back towards the dark entrance to the building. There was no sign of what had happened to Kutta. A shriek made him jerk back around. Vimbo had managed to catch up with the dog and they were tangled in cables together. Vimbo gave a thrash backwards and Mhumhi saw he had the dog’s rear leg in his jaws. The other two dogs were racing back from either side to help their comrade, who was crying out as Vimbo worried him back and forth. Mhumhi couldn’t stop himself- he dashed forward towards Vimbo, chattering. The other two dogs stopped a few feet away, ears turned towards him. Vimbo looked back at him as well, turning his head so that the dog’s haunch stretched and dragged him along the ground. He gave an agonized little cry- a cable was tangled around his neck, tightening as Vimbo pulled. Mhumhi absorbed the statement. Hlolwa’s gaze was steady, her eyes still half-lidded: she had still given the plea as though it were a command. The other free dog ducked his head with a whine; Mhumhi saw it was Imbwa. The one in Vimbo’s jaws he did not know. “What did you do with the little hulker?” he asked. “Nothing,” said Hlolwa. Mhumhi raised a lip. The dog in Vimbo’s jaws gave a rasping whine, his mouth opening and closing slowly. Imbwa cut himself off and took a step towards him. Vimbo flicked an ear in his direction. “He’ll die soon if the hyena doesn’t let him go,” said Hlolwa. Mhumhi met her gaze, evenly, and was pleased to see her hooded eyes widen slightly. For all her regal bearing, there was a new weariness to her that he had not seen before, a new sense of anxiety. With a furious chatter Imbwa lunged forward at Vimbo, catching him on the lip- Vimbo squealed and they thrashed for a moment. Imbwa went tumbling backwards, down the hill. Vimbo, one side of his muzzle a sear of blood, leapt heavily forward after him, his weight bearing downwards. They vanished together. Hlolwa ran forward past Mhumhi, as though he weren’t even there, and looked down; after a moment’s hesitation he followed her. At the bottom of the hill Vimbo was crouching over top of Imbwa, who was on his back, with his bared throat between his teeth. After a moment Vimbo drew away; Imbwa’s head flopped limply to the side. Mhumhi turned to Hlolwa, who was still beside him, and found that she was staring silently; and then she slowly lay down, and put her chin on her paws. Vimbo raised himself, his tongue curling out to lick his lips. The wound on the side of his muzzle looked bad- it was still bleeding heavily. When he swiped some of the blood away with his tongue Mhumhi realized that Imbwa had torn off a piece of his lip, so that his teeth were bared on one side in permanent snarl. He stepped forward. Mhumhi gave a twitch, looking between the hyena and Hlolwa, who had not moved from where she was lying, her eyes dull. Vimbo braced his paws at the foot of the hill and craned his neck to stare up at her, his new, bloody grimace lending him a vicious air. Mhumhi’s ears suddenly filled with yapping, and he turned both backwards. Vimbo raised a paw, thrusting his head outwards. The voice was clearly Mini’s, and he looked back to see Sekayi stumbling and puffing his way to the top of the hill. When he saw Hlolwa, he froze. He stopped. She was what? Subdued? Captured? There was nothing to stop her from turning and lunging at Sekayi, though he hoped she would not, knowing how outnumbered she was now. She could also get up and run away. But she did not, nor did she show any reaction at all as Sekayi hesitantly came closer. “Wait,” said Mhumhi, and he moved to put himself between Hlolwa and the bouda, casting wary glances at her haunches. Mini popped her head out of the bag on Sekayi’s shoulder. With a kind of whine Vimbo burst over the hill, passing Hlolwa. He stopped short near where Mhumhi was standing in front of Sekayi. The fur on Mhumhi’s back rose. “Vimbo!” cried Mini, and the bag wriggled. “Oh, Vimbo, there you are! Oh, what happened to you?” She switched to rapid hulker, her pink tongue flashing between her jaws. Vimbo began to sway, an intoxicated motion, and Mhumhi put his ears back and raised his tail. He had seen the hyena move like that before. Vimbo darted sideways, loping in a broad semicircle, his eyes on Sekayi. Mhumhi sprang closer, growling, and Vimbo gave a shrill giggle and showed his teeth. “What’re you doing?” Mini shouted. Sekayi was stepping back, one hand clutching the bag to his side. Vimbo bobbed his head and whooped, his short tail curling. “Vimbo!” snapped Mhumhi, and got in front of him again, bristling, glaring. Vimbo looked at him with his lower jaw hanging down. The fur on his face was darkened with blood. Mhumhi suddenly felt a spike of fear: Vimbo had just killed three painted dogs, and he had the same sort of pelt. The hyena lunged forward, squeal-growling, and Mhumhi reared and snapped with surprise. Vimbo ran around him, barreling towards Sekayi and Mini. Mhumhi did the only thing he could think of and leapt forward and sank his teeth into Vimbo’s flank, shearing through other wounds. Blood filled his mouth and the hyena shrieked. Mini was shrieking something too. Mhumhi let go, panting, head lowered. Vimbo, one rear leg raised, curled back to stare at him, mouth open. Vimbo gave a shambling step sideways, his head swinging around. Desperately Mhumhi called out to Mini. He was glad Mini was the type to catch on quickly, because she did not question him, just began speaking in hulker, her tone urgent. But Vimbo was swaying again. It was like the time in the computer room, where he had gone berserk; there was the same kind of hollow, raw feeling coming off of him. Mini was still talking, but Vimbo looked back at Mhumhi, who felt a kind of jolt. He started limping towards Hlolwa. “No, Vimbo!” said Mhumhi, running over before he thought about what he was saying, but the hyena did not even spare her a glance, just slid through the trash down the hill again. He sniffed Imbwa’s empty body for a moment, then moved onwards, keeping the weight off of the haunch Mhumhi had bitten. He was towards the sea, which was just barely visible between two hills ahead of them. Vimbo looked back at him, setting his leg down. His clown’s face, bloody and grimacing, no longer looked so foolish, but his dark eyes were as empty as ever. Mhumhi found that he had nothing to say- could say nothing that the hyena would understand, anyhow. Vimbo started moving again. “And what about that one?” asked Sekayi, pointing at Hlolwa. He pointed to the left. The painted dog that Vimbo had tangled in the cords was still there, head raised to look at them, though he didn’t seem to be able to get up. Mhumhi had nearly forgotten about him. “We’ll get him later,” he said. The dog said nothing. “Where’s Vimbo going?” fretted Mini, but Mhumhi ignored her and went beside Hlolwa. “Get up and come with us,” he said. She did not so much as look at him, her chin on the ground, her eyes half-lidded. Mhumhi raised a lip. Hlolwa gave that odd expression of hers, where she pulled a lip back on one side of her mouth, exposing her molars in a kind of grin. Mhumhi snarled and snapped his jaws warningly above her head. Hlolwa flicked her eyes towards her injured packmate, then slowly pushed herself up on her forelegs. “You will help him,” she said. “We’ll do as we wish,” snapped Mhumhi, turning his back on her. He felt her gaze boring in to him from behind, but she followed him quietly. They went back to the concrete building in a kind of uneasy line, Sekayi and Mini in front, Mhumhi in the middle, and Hlolwa trailing in the rear. He could not get the fur on his back down with her there, but he also did not want to start glancing back and see the contempt in her eyes. Sekayi hesitated at the dark doorway. Sekayi did not argue, and neither did Mini. Mhumhi went into the building and Hlolwa followed him without a word. He had been frightened that there would be a painted dog ambush waiting for them inside, so he was live-wire, quivering, as he prowled through the dimness of the front room. Hlolwa came behind, pausing to sniff Sekayi’s chair. Mhumhi wanted to reprimand her for that, for some reason, but he kept his jaws shut. They went into the next room and Mhumhi’s nostril’s flared. A dark shape detached itself from the wall. Mhumhi blinked, his eyes adjusting, and made out his sister’s form. She was crouching near a big lump in the middle of the room that smelled like hulker blood. Mhumhi stepped closer to the lump and realized that it was the screamer, crouching with her arms curled tightly around Tareq, Tareq himself was uncharacteristically silent, but Mhumhi could hear his slightly raspy breathing. It was Dot that smelled of blood, he realized. There were bite wounds on her arms and shoulder, though it was hard to make out how serious they were in the dark. “It’s fine,” said Mhumhi. He stepped a little closer to Dot, who grunted and tightened her grip on Tareq. Mhumhi heard the breath go out of him. Hlolwa took a measured pause, and Mhumhi felt his sister’s yellow gaze lancing out at her. The two of them managed to more or less herd Dot back through the building. She moved in a quick shambling crouch in response to their encouraging chatter, one knuckle on the ground, the other arm clutching Tareq to her chest. Tareq had his arms around her neck; Mhumhi saw that his eyes were wide in the darkness. Hlolwa followed behind, not helping, but not hindering either. Mhumhi found he didn’t want to look at her again. They came to the door, where Dot stopped short: Sekayi was standing there, peering inside. “Tareq?” he said, seeing them, and Dot rushed forward clasping him around the shoulders and squeezing Tareq between them. “Ow!” yapped Mini, who must have been somewhere in that mix as well, though Mhumhi couldn’t see where. Dot stepped back and he saw that Tareq had been transferred to Sekayi, who looked a little lopsided under the sudden weight. “Are you all right?” he asked, setting him down on his feet. “Yes,” said Tareq, very quietly. Mhumhi went up to him and sniffed him over, as did Kutta, her tail wagging. He was whole and quite fine, aside from a few scratches on his arms that might have been inflicted by Dot’s nails. “Bad dogs again,” said Tareq, and he scrubbed one eye. Mhumhi reared up to lick his face, and he sniffed. “What about that one?” asked Tareq, and pointed at Hlolwa. “She won’t hurt you,” said Kutta, giving Hlolwa a ferocious look. Predictably, Hlolwa said nothing, just narrowed her eyes further. “Where’s the ‘yena?” asked Tareq, drawing back into Sekayi. “He went away too,” said Mhumhi. They all went back outside, excluding Dot, who hovered back in the doorway. Mhumhi saw tearstains on her cheeks, and she would not look directly at them. Sekayi sat Tareq back down on the old car, then produced a stake and a thin chain. Mhumhi was surprised when Hlolwa permitted him to put it around her neck, securing her, without complaint, though afterwards she finally spoke up. “We’re not in the city, and we don’t take orders from you,” Mhumhi snapped, but Sekayi rose from where he had been crouching to affix the chain to the stake. “Sekayi,” said Mini, disapproval in her tone. Sekayi gave a little smile. “He was towards the sea” was heading toward?